Well Dave and I's latest adventure was Palo Duro Canyon located near Amarillo, TX. How Dave finds out about all of these hiking places I'll never know, but he does. I guess it is kind of like how I find coffee shops in the middle of no where. =) It's pure skill, I tell ya. Our original plan was to camp and hike at the Wichita Mountains in Oklahoma but rains swept across all of Oklahoma and cancelled that for us. Instead we drove over to Amarillo, TX, spent the night at a hotel and hiked the next day. Palo Duro Canyon is the 2nd largest in the US (after the Grand Canyon). We hiked a bunch. Honestly, more than I expected (around 13 miles) and I ended up being a mean grouchy bear (poor Dave). We bickered more than we ever had (gasp!) and we both figured out real quick that bickering isn't so fun. After we got home we talked things out and are fine but I gotta say ... hiking and bickering don't go so well together. I'm thankful for forgiveness and getting over things quickly. Anyways, besides me being grouchy and the bickering we still managed to have a good time and the canyon was rather beautiful. I got to use my new camera and try out some different settings on it and I even surprised myself at some of the pictures I took. If you look really close you can see the moon in this picture. 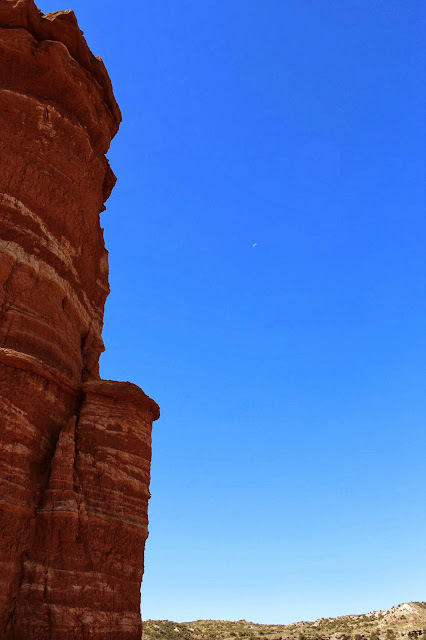 I loved the red canyons against the blue sky - God makes beautiful things. 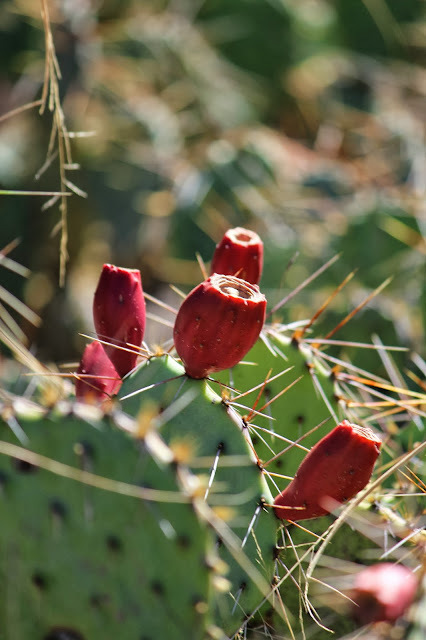 I love the burst of color in the dessert like setting; a good reminder that even in 'dry seasons' of life there is something good and beautiful. Check out this little lizard. I kind of like him. Dave and I see all kinds of lizards and I enjoy it now rather than screaming like I used to. and check out this cute little wiener dog. I think he is so cute, and tough. This hike was almost 6 miles and he had gray hair on him. What a good dog. We also saw a tarantula. I took a picture but no way do I want to post a nasty thing like that on my blog. Well, that was our short over night trip. Do you like to hike? Any one have any favorite hiking spots? Ha! Don't worry, you're not alone on the grouching and bickering thing. It happens but we make up (or out?) in the end. My husband's kind of the same too. He just finds these really cool trails and has a good sense of direction unlike me. He's my walking GPS. By the way I'm a newbie hiker, and I love the mountains and trails here in Phoenix.